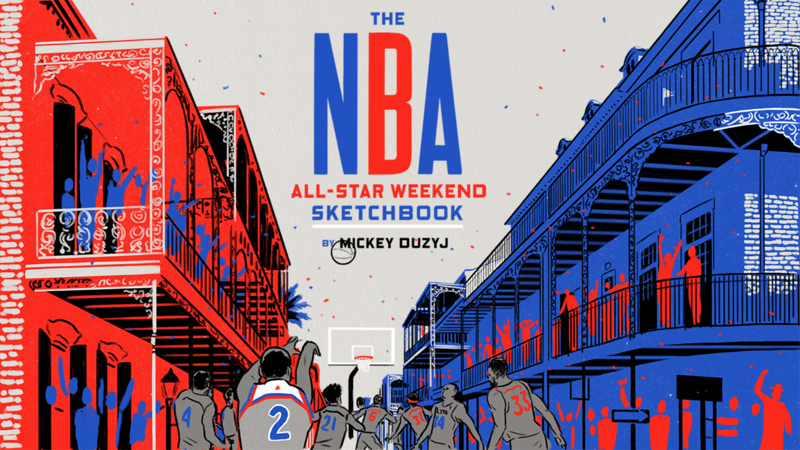 The scene in New Orleans from start to Anthony Davis' big finish through the eyes (and hands) of illustrator Mickey Duzyj. Jimmy Butler, Russell Westbrook and James Harden bring a little NBA style to the first big parade weekend of Mardi Gras. The Saints superfan is everywhere all weekend, but he steals the show by coming out of the stands and draining a shot. Gordon returns to New Orleans and turns boos to cheers, beating Kyrie Irving 21-18 in a shootoff for the title. At Coco Bongos, a "mobile sports bar" at Canal and Bourbon, an extra shot is $3, but the hangover is free. A big night: the MVP breaks Wilt Chamberlain's All-Star record and gets a new teammate in Demarcus Cousins.